Ovarian cancer starts when cells in the ovaries grow out of control and form tumors. More women die of ovarian cancer than any other type of reproductive cancer. In 2018, about 22,240 women will get a diagnosis of ovarian cancer. About 14,070 women will die from it. A woman’s chance of getting ovarian cancer is 1 in 78. New cases and deaths from ovarian cancer have declined since 1992. Catching the cancer early increases chances of survival. Gynecologic oncologists are doctors who specialize in treating ovarian cancer. There are also several treatment options for ovarian cancer. Some drugs, surgeries and cosmetic products can affect the risk of ovarian cancer. Symptoms of ovarian cancer vary depending on how serious it is. Many times, ovarian cancer has no symptoms. If there are symptoms, they are mild. This makes ovarian cancer difficult to detect. Could these symptoms mean I have cancer? 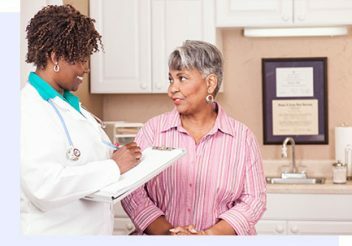 Are there tests to check for cancer? Could these symptoms be from another health issue? 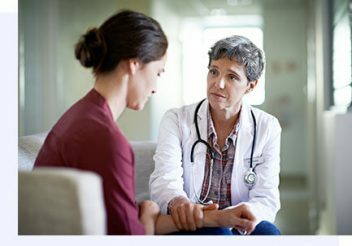 How do Doctors Diagnose Ovarian Cancer? Often, early ovarian cancer doesn’t have symptoms. 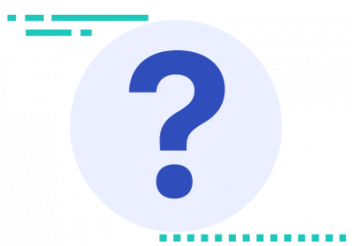 If there are symptoms, the doctor will ask questions and do a physical exam. Then, he or she will run some tests. 70 percent of ovarian tumors are not found until cancer has spread. uses sound waves to make pictures of the ovaries. are X-rays that take pictures of the ovaries. is a type of surgery that uses a small camera attached to a tube to look at the ovaries and other body parts. detect protein levels in the blood. Cancer cells cause proteins to go up. 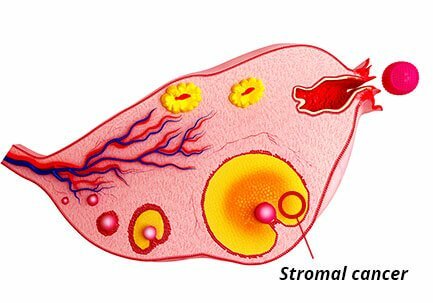 use samples of ovarian tissue to check for cancer cells. This is the only way to tell for sure if you have cancer. How long with these tests take? Can you explain the tests to me? There are several types of ovarian cancer. But, there are three main types. The type of cancer determines the treatment. It also affects survival rates. About 90 percent of ovarian cancers are epithelial carcinomas. is a tumor that starts on the outside of the ovary. The majority of ovarian tumors are epithelial. starts from ovarian cells that make hormones. Doctors can typically diagnose these early. starts in the egg cells. These tumors are very rare. They occur in younger women and girls. Can you write down what type of cancer I have? What should I know about this type of cancer? Doctors use tumor staging to determine how serious ovarian cancer is. The stage depends on how far the cancer has spread or metastasized. Stages go from 1 to 4. Stage 4 cancer is the most serious. The stage of cancer determines how likely someone will survive five years or more. Stage 4 ovarian stromal tumors and germ cell tumors have better survival rates than epithelial tumors. Stromal tumors have a 35 percent survival rate. 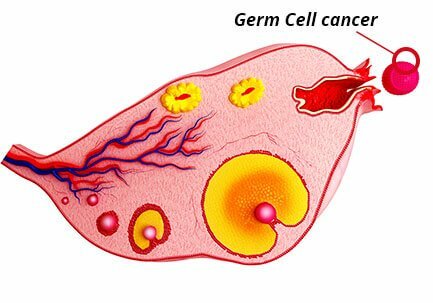 Germ cell tumors have a 69 percent survival rate. Can you explain the stage to me? A doctor will determine the treatment plan depending on the stage and type of ovarian cancer. The health of a patient and treatment side effects also affect treatment options. Most of the time, doctors recommend surgery. Oncologists will remove as much of the cancer as they can. Sometimes, the doctor will have to remove other body parts with tumors. Chemotherapy uses drugs to kill cancer cells or shrink tumors. But, it can also kill healthy cells. Some ovarian cancer chemotherapy drugs have serious side effects. For example, Taxotere may cause permanent hair loss. Targeted therapy uses drugs to attack cancer cells and reduce harm to healthy cells. This is a newer treatment. There are several kinds of targeted therapy. Hormone therapy uses hormones or hormone-blocking drugs to fight cancer. Doctors don’t often use this type of therapy on epithelial ovarian cancers. Radiation therapy uses high-energy rays to shrink or kill tumors. In ovarian cancer, radiation treats tumors that have spread. Does this treatment have side effects or complications? Will vitamins, herbs or certain foods help? What happens if this treatment doesn’t work or the cancer comes back? Certain factors can increase or decrease your risk of getting ovarian cancer. The number one risk factor is age, according to the American Cancer Society. There are also certain drugs or products that may increase your ovarian cancer risk. 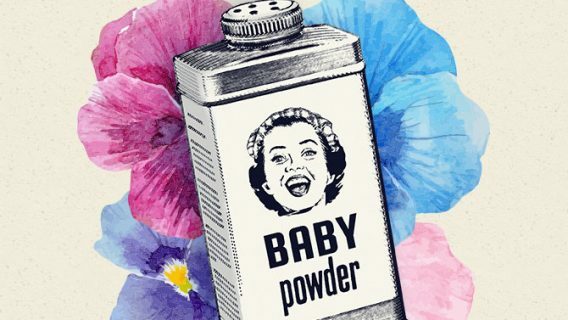 Studies show women who use talcum powder in the genital area may develop ovarian cancer. Cancer risk goes up with age. About half of all ovarian cancers affect women 63 or over. Women who use birth control pills or get a Depo-Provera shot have a lower risk for ovarian cancer. The fertility drug Clomid (clomiphene citrate) may increase the risk of ovarian tumors. Women who have BRCA1 or BRCA2 genes have a higher risk of ovarian cancer. Women who take estrogen after menopause could increase their risk of ovarian cancer. Drugs that increase male hormones, such as Danazol, may increase ovarian cancer risk. Women with a body mass index of 30 or higher are at increased risk of developing ovarian cancer. Women who had babies before age 26 have the lowest risk of ovarian cancer. The risk goes down with each child born. Women who get their tubes tied or have a hysterectomy reduce their risk of ovarian cancer by as much as two-thirds. Some studies linked long-term genital talcum powder use to increased ovarian cancer risk. Women who eat lower fat diets may lower their risk of ovarian cancer.